Today’s flatlay – Bonjour Knit by Markus Lupfer (old) / Red Sunglasses old but similar here / Bag Hermosa London / Jeans J Brand Selena / Trainers Adidas / Body Oil Connock London Kukui Oil / Le Labo Santal 33 / Eve Lom Kiss Mix. This morning’s flatlay inspired me to write a blog post on slogan knits. Now, I have to admit I am a little bit fussy when it comes to slogans. I think that there is a fine line between tasteful and tacky, but I am afraid I couldn’t give you any defining characteristics, it’s simply a ‘yay’ or a ‘nay’. I am exactly the same when it comes to florals. It’s just a gut feeling. Some I love, others I loathe. I suppose if I really drill down on slogans, I tend to veer toward very simple slogans and designs (usually french) and I avoid anything too wordy, too youthful or too political. If I think it’s something my twelve year old daughter would wear, it’s a definite no! My Markus Lupfer ‘Bonjour’ knit is at least four years old, which I think goes to show that slogans stick around and it is worth investing in good quality. 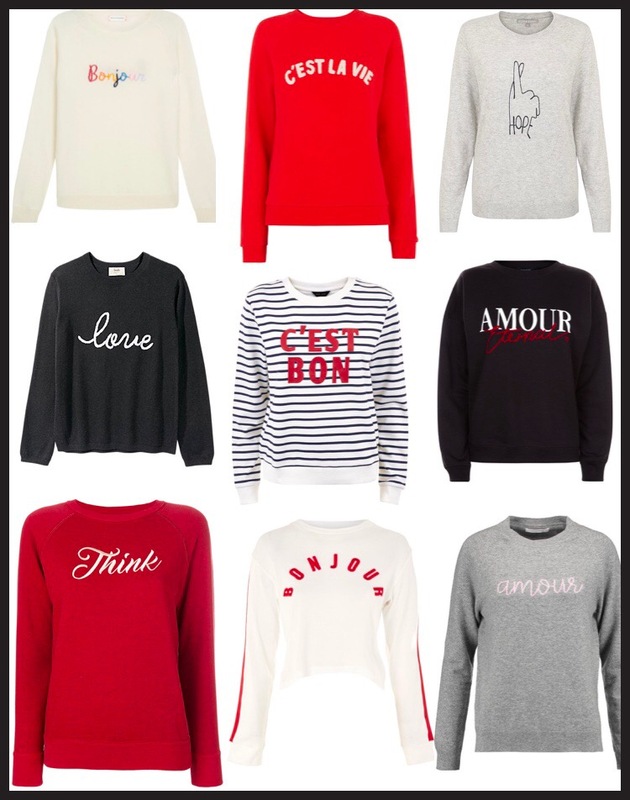 My favourite slogan jumpers are from Bella Freud and Chinti and Parker (almost all of them bought from sample sales or sales) and they still look great, despite years of wear and washing. I should mention that I couldn’t live without my cashmere comb. I wear a lot of cashmere and have found that even the softest, most expensive cashmere will bobble. It’s not a sign of poor quality, I think it’s just what happens to cashmere over time, but a little comb before each wear and you will keep your jumpers in great condition. Here is my edit of my favourite slogan knits and sweatshirts available at the moment. Happy Shopping and thanks for reading as always. Thanks- you have already facilitated some of my cashmere buys! Can you recommend a particular comb? Don’t have one. That’s so kind for you to take the time to reply. Thank you! Have ordered myself one. And no delivery charge- woo hoo! I was just about to donate a cashmere jumper as I thought there was no saving it so thanks for that! Can you use this comb on regular knits too? Loving these – the French ones are the best aren’t they! ?